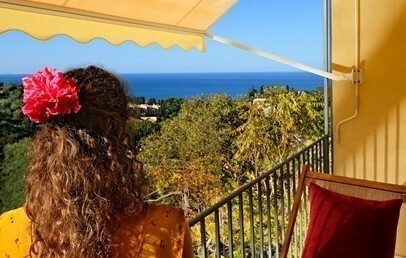 Set in a lush Mediterranean garden, with three ancient mills in the grounds, the Hotel Alberi Del Paradiso looks out over the bay beneath, with a marvellous panoramic view over the sea and beautiful Cefalù, with its characteristic castle. The setting of the hotel is ideal for guests looking for the peace and quiet of the countryside but within easy reach of the town and beach. There are a number of cultural and natural attractions in zone, such as the Norman Cathedral (13th century) (2 km), the Madonie Nature Park (10 km) and the small town of Santo Stefano, famous for its ceramics (30 km). Built at the end of the 1960s, this stylish 4-storey building has recently been refurbished and extended, yet still maintains its classic style. Service is attentive and unobtrusive – the aim of staff being to ensure guests truly feel at home. The restaurant offers wines and dishes of excellent quality. In the 12,000-m2 garden surrounding the hotel you will several services: the panoramic pool with water heated by solar panels and a hydromassage niche, is surrounded by a fine solarium. 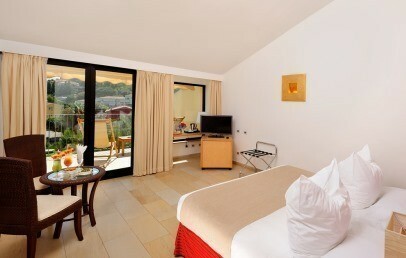 Guests can also use the Wellness Centre, the tennis court in artificial grass and a cardio-fitness room. Set in the garden is also a small playground area dedicated to the kids. 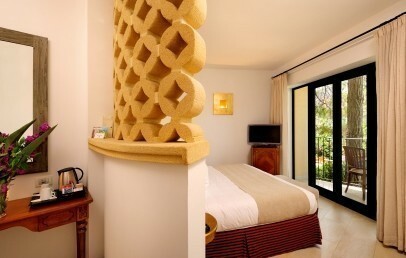 The hotel’s 55 rooms are set on four floors, easily reached from the lobby with a lift. 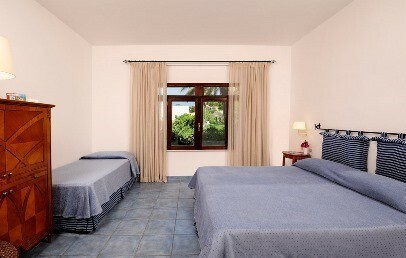 Looking out either over the garden or the sea, all rooms are carefully furnished and offer maximum comfort. Note the HVAC system based on natural cooling and modern technology. 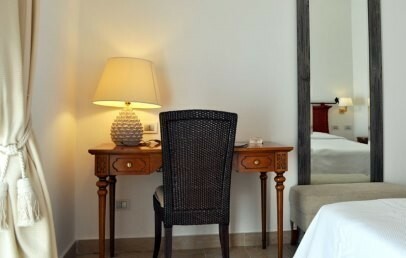 All rooms have fine Egyptian cotton sheets and Wi-Fi connection. The beach is of fine white sand, situated in the centre of the Cefalù waterfront, just a short distance from the hotel and in the high season can be reached by a shuttle bus, a service offered free of charge by the hotel. 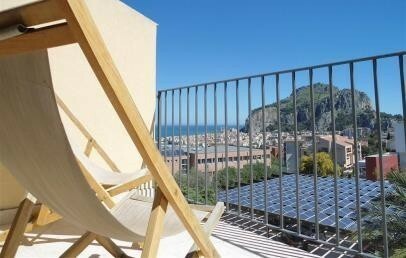 From May to October, the beach is equipped with sun loungers and beach umbrellas. The hotel’s small spa occupies a truly unique site, set in one of the ancient water mills in the grounds. It offers a sauna, a hamman, showers and massage room. The hydromassage pool is set in the open, in the garden, together with other zones dedicated to massages and treatments. 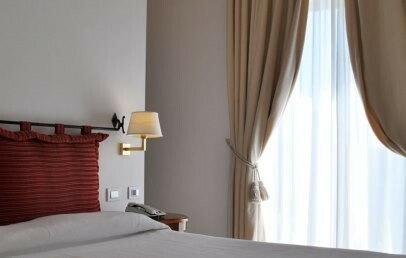 The hotel restaurant offers traditional Sicilian dishes, with the addition of intriguing modern touches by our Chef. Recipes, based on fresh-caught fish and locally grown vegetables, offer organic products and slow food. The wine list offers more than one hundred different labels from the best Sicilian wineries. In the cold months, meals are served in an elegant internal restaurant, while in the summer they are served on the splendid terrace looking out over the garden. Your stay can be booked as either Bed & Breakfast or Half Board. For lunch a supplement is payable in the hotel. Services included are shuttle bus to the beach and town, external pool, covered vehicle parking, Wi-Fi connection throughout the structure. The beach is equipped with umbrellas and sun loungers during the high season and this too is included in the price of your stay. 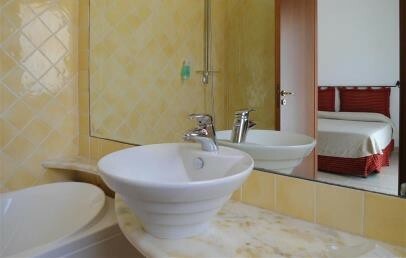 Entry to the Wellness Centre, use of the tennis court and laundry service attract payment. Our staff is available to help you choose and book the best excursions in the area. Check-in is from 14:00 and check-out up to 11:00; late check-out is subject to availability and attracts extra cost starting from 13:00. The double Classic has a full range of comforts and has a window with garden view, and classic furnishings in cherry wood. 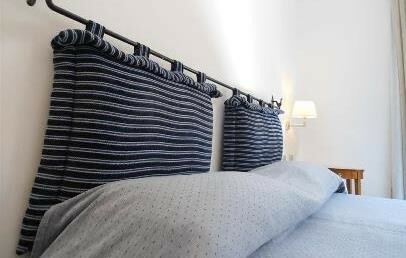 The Superior room has a full range of comforts, plus a balcony looking out over the garden and classic furnishings in cherry wood. 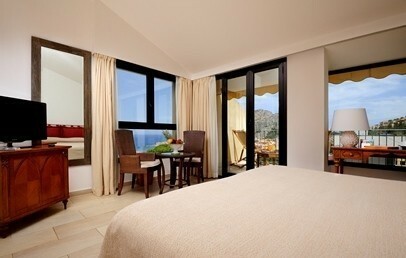 The Deluxe room has a full range of comforts and a balcony with sea view and classic furnishings in cherry wood. The Classic has a full range of comforts and has a window with garden view, and classic furnishings in cherry wood. 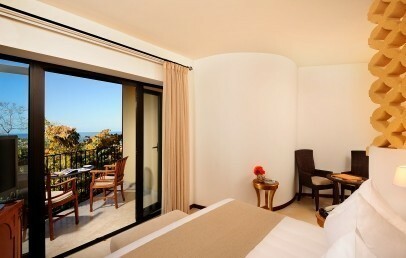 The Prestige room has a full range of comforts and a terrace with a sea view and classic furnishings in cherry wood.